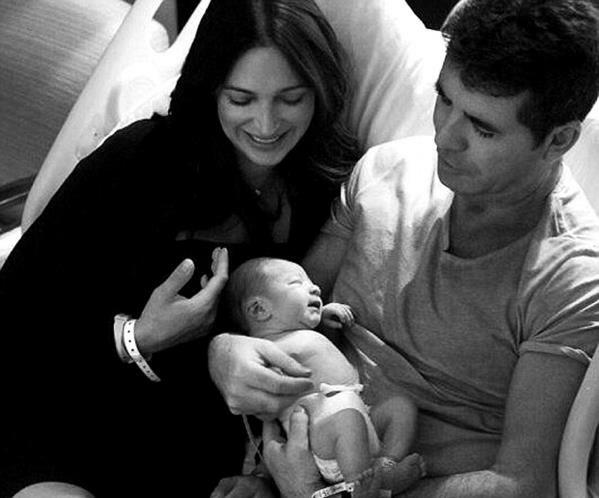 Simon Cowell and Lauren Silverman welcomes their new baby boy! Two proud parents Cowell and Silverman their new baby boy Eric. Proud father Cowell couldn’t wait to show off his new son and posted pictures on twitter next to former girlfriend Lauren Silverman, who she gave birth to on Valentine’s day. Aww how sweet! It was said that the X factor judge ran straight from the Britain’s got Talent auditions held in West London’s Hammersmith Apollo, and got the first flight to New York to see their baby be welcomed in the world. Practically Everyone who was close to the couple was going twitter crazy after the baby Eric was born. The music and TV mogul took to Twitter to confirm the baby’s name and time. It said: ‘Very happy to say Eric was born at 17.45pm. Healthy and handsome. Lauren in great shape.Thanks for all of your kind messages’. he wrote on his twitter page. The name was a tribute to Simon Cowell’s father Eric Cowell who died at the age of 81. Ex-X factor judge and friend of the couple Piers Morgan wrote: ‘Lovely tribute to name his son after him’. I think I’m not only one by saying that myself and thousands of viewers are happy to see Simon has finally found someone to settle down with and start a family together because let’s face it, at the age of 54 and it’s your first born, time wasn’t on his side ha-ha. But I’m happy to the two. CONGRATS!